1. How do we create conditions that maximize mastery of learning? 2. How do we maximize student learning through sound assessment design? The majority of our time was spent discussing the concept that assessment methods are not interchangeable. Thus, we talked about the most relevant assessment method to be used for the type of learning target being assessed. This helps to ensure accurate assessment results. The four assessment methods are 1) selected response, 2) written response, 3) performance assessment, and 4) personal communication. Many of us were surprised with the research-based results (provided below). This spurred very interesting dialogue, especially when looking at different content areas! Following this dynamic discussion, we had four groups of teachers share lesson demos. The first was our Bio team of Quinn Loch and Krista Glosson who discussed how they restructured their standards to increase a focus on key domains. They also shared how they report grades both formatively and summatively in a non-standards-based online gradebook to communicate the most accurate information on achievement to students and parents. Our second lesson demo was by Kim Miklusak, discussing the evolution of changes in the AP English Language grading rubrics from 4-degrees to 3 in order to clarify definitions of mastery and proficiency. This rubric also mirrors the biology rubric to help increase cohesiveness of skills between content areas. Next, Bonnie Kale shared the idea of having one essential question in Honors Written and Oral Communications for a unit. This unifying element allows for students and teachers to synthesize information and skills in order to maintain a focus throughout an entire novel. This also allows the team to reloop through writing and reading skills all centered around one theme. Finally, Sandra Lee and Katie Winstead shared how they differentiate formative feedback in Prep World Literature. 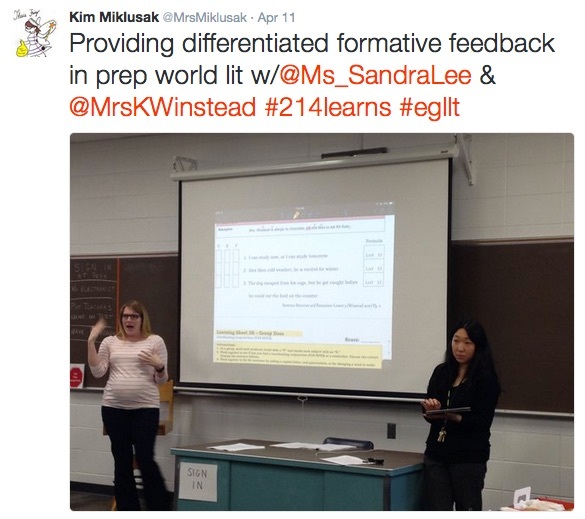 They build in elements of a pre- and post-test as well as clear learning targets in order to allow them to modify instruction to meet the needs of a wide range of student ability levels. Regardless of grammar ability, all students learn the same materials at a different pace and with targeted teacher support. Thank you to everyone who presented and participated yesterday! 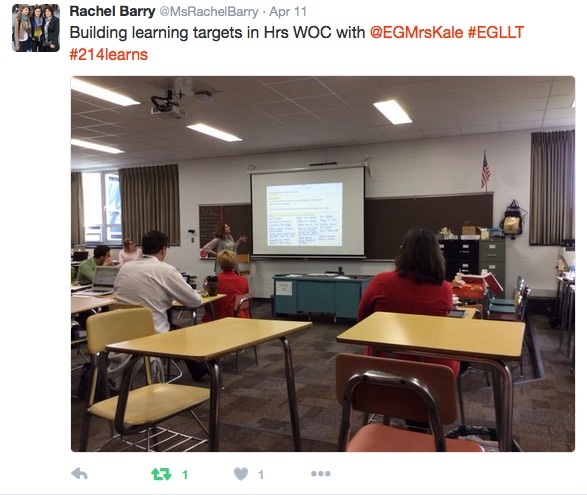 We are looking forward to more conversations in upcoming PLTs and at next month's presentation! 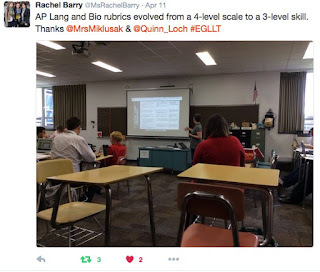 To learn more, follow the #EGLLT hashtag on Twitter or stop into the CollabLab for more conversations!